I absolutely love this quilt!! I found it to be exactly as described and it looks great in our home!! Great to mix with brights for fun look. A little grayer than pictured but OK. I am a devout Overstock shopper. I buy regularly and am almost always pleasantly surprised. Their customer service is excellent. As a design professional, I use OS regularly for my projects with confidence. Love the selection! Quilt does not look like the photo. The tan spaces are a very dark gray. Don't purchase if you are looking to match white or ivory accessories. Love this blanket!!! Its heavy and looks great. Well be great year round and for the holidays. Would recommend!!! This is a gray and black buffalo check. This quilt set arrived and was very nice. The quality was exactly what I had hoped for. I had planned to redo my guest bedroom and use this set but opted to go with a different color scheme so returned it. Overstock has an easy and convenient return policy. I am very impressed with this quilt set! I bought two sets for my mountain cabin sofa sleepers. It is thick and obviously well-made. It had quite a strong plastic odor immediately upon opening, but the scent dissipated quickly. It looks great, feels great, and I would recommend it. The colors of this quilt are beautiful. I am using this in a guest cottage that is almost completed...so it has not been put on the bed yet. The quality of this does seem really good though. I will update my review once I set it all up. Beautiful quilt but the gray base color is much darker than pictured it in person. I'll be returning and hopefully can find another Woolrich quilt that is closer to what is pictured. Edited to add: Easy return and very happy with customer service. Sad that this was not what I was looking for, so... the search continues! 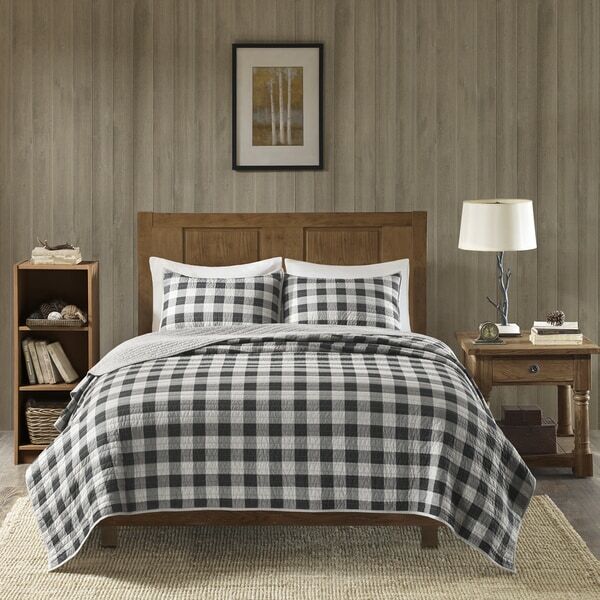 Love this bedspread, Its warm and finally found a long enough bedspread for a king size bed. Looks Great on my bed. This Woolrich quilt is just what I wanted, not too heavy but great for a winter vacation home. The quality is very good, I expect that it will wash well as it is not bulky. The colors are good! Seems like good quality, I like the weight of it, perfect for my climate. I would give it more stars but for some reason I thought it was grey and white but it is navy and blue. The quality is nice and it came very fast. Great for cabin or boys room for sure. More of a warm grey and navy blue color and medium weight quilt, great buy! Beautiful and had to wash it already but I haven't seen how well it upstands the washer. I love the way it looks on my bed. Its what I was looking for and light weight. This set is totally Woolrich quality!!! fits queen size bed great, even high profile. The ONLY NEGATIVE is the chemical smell. After one washing it was still there, had to air it out for a bit before using. But STILL very, very pleased with this purchase! Color was different than I expected. Had an odd chemical smell. I returned it. "Is this blak and cream"
It's black and a very, very light gray. "The description says gray but it look black. Which is it?" "is the white true white or off white"
In my opinion it is off white.